Lunch today was a yummy tomato (only the second tomato this season! 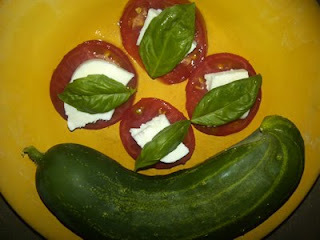 ), mozzarella, and fresh basil. And I had to show off the first cucumber from my vine! Last night I was looking over my hand written journal of thoughts and drawings on the community garden (I got the awesome journal from the SLCC Writing Center). On one of the first pages of the journal I wrote about why I like gardening (which is different than the post on why I want to be in a community garden). Why do you like to garden? I've never thought about liking gardening, Paula. Hmm. I think it might be a sort of nostalgia thing for me, but I also believe that in growing stuff, we can learn a lot about ourselves and, quite honestly, become better, more grounded (meh--a pun!) people.